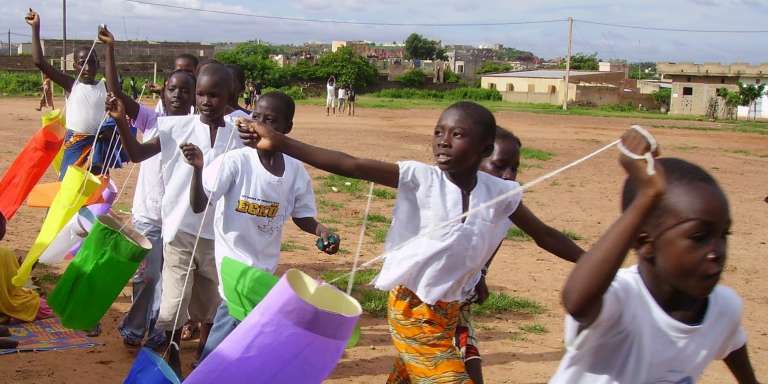 Libraries Without Borders has been supporting libraries and schools in Mali since 2010. Two crises have seriously affected Mali’s libraries and schools in the northern part of the country since the begining of the decade. In 2011, Mali suffered from severe food crisis where the northern regions of Timbuktu, Gao and Kidal were particularly affected. The alimentation crisis grafted into a political security crisis in 2012 due to rebellious army groups in the north and coup d’état. In order to support the development of reading and libraries in Mali, especially for the youngest, Libraries Without Borders worked alongside its partners to create libraries, send books and organize workshops in schools. The Kalaban Coro Community Center in Bamako opened its doors on December 10th, 2001. It is an associative structure run by residents of the neighborhood eager to offer educational and recreational activities to a public for the most part consisting of children, young people and women. A library that today contains more than 3000 books and 1400 registered readers has opened within the Community Center. As part of the AFLAM project to support the Malian book network, it is open to all and attached to a public library. It is open three afternoons per week with assistance from 4 student volunteers trained by the National Public Reading Center and the French Cultural Center of Bamako. The library organizes many book-centered activities and participates in large public events such as “Lire en Fête,” Francophone Week and the “Printemps des poètes.” LWB contributes expertise to these events. To expand the resources available to the Center’s library. To allow the Community Center to attract a larger public via its schedule of events. Contributing expertise to help establish certain Community Center projects. Donating 300 children’s and university-level books to the Kalaban Coro Community Center. The 1400 readers already registered with the library as well as new users. Library personnel involved in organizing new activities.